American Theater Company (ATC) announces the ninth annual production of “It’s a Wonderful Life: The Radio Play” adapted from Frank Capra’s classic film. Bedford Falls, 1948: ATC transforms its intimate space into an actual 1940s radio studio to tell Capra’s classic story of one man’s affect on his community. Complete with audiograms and commercial breaks, audiences may be recorded live for broadcast on WBEZ Chicago Public Radio. Free milk and cookies are served after every performance. The production runs Nov. 26-Dec. 26, 2010, at American Theater Company, located at 1909 W. Byron St. in the Lakeview neighborhood. Shows run Thurs.-Fri. 8 p.m., Sat. 3 p.m. and 8 p.m., Sun. 3 p.m. Call 773-409-4125 or log on to www.atcweb.org for ticket information. If you like gourmet sandwiches and craft beers, Jerry’s Sandwiches is the place to be. 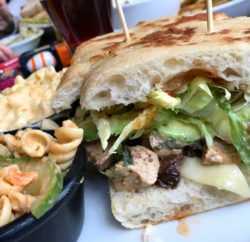 The restaurant offers more than 100 sandwiches and 180 craft beers, bottled and on tap. Sandwiches at Jerry’s can make even the tamest palate anxious. Ingredients are decidedly high-class and include brie, grilled asparagus, chipotle chutney and homemade olive relish to name a few. The majority of the unique sandwiches are named (like the Alexis D, which has turkey, apple, Swiss, tomato-basil relish and lemon mayo), but you can also get the standard burger. The popular Wicker Park location has live performances from local bands most nights of the week. If you think a sandwich won’t fill you up, don’t worry, as each sandwich comes with two equally gourmet sides. Jerry’s is located 1938 W. Division in Wicker Park. Walking into Teavana, you will be tantalized by the scents of rows of loose-leaf tea. The store is a safe haven for the tea connoisseur, a place where the sometimes bitter taste of coffee has no home. You can buy tea by the ounce, savor some tea-infused chocolates, indulge your shopaholic tendencies and purchase a clay teapot, or even join a tea-of-the-month club. There is always a wide selection of every tea imaginable, and you’re encouraged to mix and match the flavors to suit your tastes. My favorite? Strawberry lemonade pomegranate tea. Teavana is located conveniently downtown in Water Tower Place at 835 N. Michigan Avenue. Vintage Underground offers a unique experience for shoppers interested in avoiding the crowded Magnificent Mile. This discreet, yet eclectic shop carries a wide array of vintage furniture, jewelry, clothing and collectibles for men and women. As a basement thrift store, perusing Vintage is like a journey back in time. Where else can you find jewelry in mint condition, swanky furniture from your parents’ generation and a tandem bike under the same roof? Carlos Pascoll, co-owner of Vintage Underground, also creates jewelry from old clocks, glass, metals and bullets. When he’s not creating a one-of-a-kind piece, he and partner Ellen Sax attend large estate sales throughout the Midwest. New items are constantly making their debut in the store, and the sales associates are knowledgeable, helpful and fun. This shop is perfect for the person who can disappear for an hour to appreciate timeless treasures and revel in knowing they’ve found something unique. 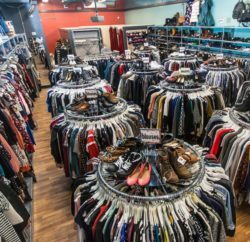 Vintage Underground is located at 1834 W. North Ave. in the Wicker Park neighborhood, just a short walk from the Damen stop on the Blue Line. Open Tuesday-Saturday. 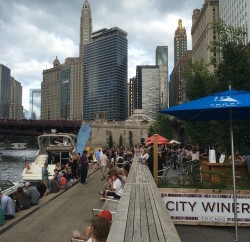 The Big City Blog: When playing host in Chicago, how much can you pack into one weekend?